This handy turntable was brought into use on American dining tables in the late 19th century. Eventually a smaller version was created to sit inside kitchen cabinets, forever moving the lives of oils and spices to the front of the pantry pecking-order. We were hoping to find a fun story behind the Lazy Susan nickname but its origins seem lost to history. Turntables let give you front-of-cabinet access to a large group of items that would otherwise be hard to see and reach. Because you access from the front and don’t have to reach in the cabinet, they are ideal for folks who are shorter or have limited range of reaching motion. 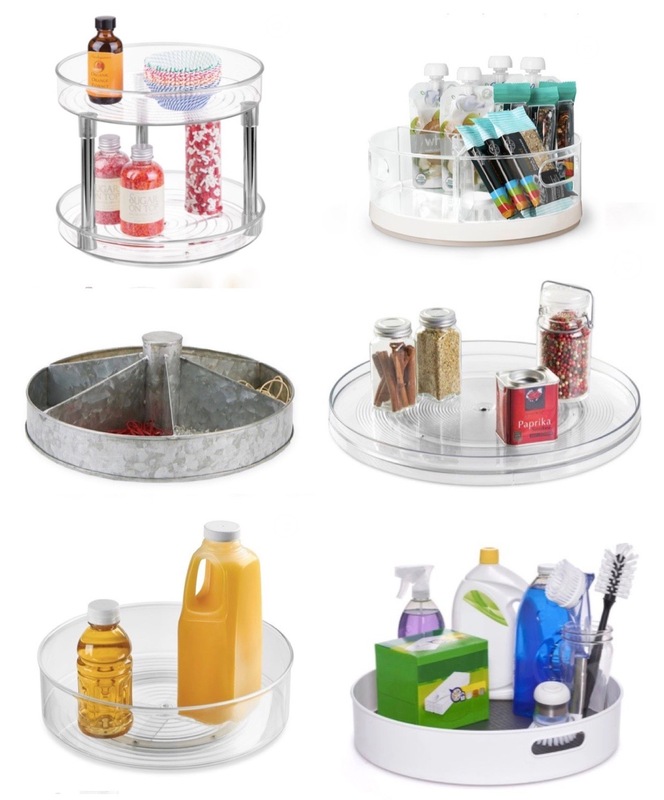 Some folks are lucky enough to have a giant Lazy Susan built into a corner base cabinet. These are great for small appliances but also pantry items. Special dividers can be added on these built-in shelves to help separate and organize smaller loose items. Turntables come in a variety of materials, sizes, and styles. Pick the style of turntable based on what kinds of items you’re trying to store. Materials: plastic, solid metal, metal mesh, and wood. Turntables work well anywhere you have small/med size items you access frequently. Consider pivoting to using Lazy Susans all over your home or office.